Bridal fashion shows are the best, aren't they? You don't even have to be the marrying kind to immerse yourself in the pure romance and escapism of designs created for the one day in the lives of most women when anything goes. And picking out designs for royal brides? Brides that actually have the venues, the tiaras, and the resources to go all out? Total guilty pleasure heaven. You should try it sometime. Or, hey, try it right now! Click on these collages to enlarge. The part of a dress that makes my heart beat the fastest is the transition from the bodice to the skirt below. When done right, it is the single greatest element in the dress, adding elegance and insanely good fit by the truckload. Upper Left: Elie Saab, Spring 2003 Couture. The veil is a little over the top, but underneath lies one of the best wedding dresses I've ever seen. The sleeves add the modesty necessary to take this gown direct from the runway to the royal aisle. Upper Right: Monique Lhuillier, Fall 2009. The twist on the bodice is amazing. It's pulling you in right where most women are the smallest, so it's going to be flattering as hell. And the way the veil is floating down over the frock is simply ethereal. Add some sleeves - detachable ones, just for the church service - and we're good to go. Middle Left: Monique Lhuillier, Spring 2010. Same principle with the bodice here as in Dress #2 - this is really something Monique Lhuillier excels at. Love how this one keeps it even simpler; even if you added sleeves, you'd still have a tremendously sleek, clean design. Perfect fodder for adding a statement veil or a really ginormous, sparkly tiara. Middle Right: Camila Elbaz, 2010. This one has amazing detail, but relieves the heaviness of overall embellishment with panels right up at the top, which would be a great way to break things up before adding a tiara. And the flow of the dress from shoulders to toes is simply divine. Bottom: Monique Lhuillier (again!). Told you she does this extremely well. When the dress flows right from the waist to the skirt and around to the back into a train, I descend into jumpy claps. You could add sleeves and increase this train to make a delectable royal creation. Sometimes playing around with the fabric on the dress can get you great results. A fabric with a great sheen to it must be played with carefully, but when done right, it draws all the emphasis to the bride (where it belongs!). Upper Left: I love the contrast between the top and the skirt, the width of the skirt (you don't always have to have a huge skirt! ), and the sleeves. Add something to the top (it looks a wee bit see through right now - which certainly won't do for a royal wedding), add a detachable train, and you're done. Upper Right: I'm nuts for the petticoat sticking out the bottom, and I don't know why - perhaps because it would coordinate great with a full veil? Bottom: The more I look at this one, the more I like it. It's a coat/dress combo, which, as I've said before, I love for a royal bride. Sure, you don't have to go with the full skirt, but if that's your thing, where better to showcase it than in a royal cathedral? Upper Left: Reem Acra, Fall 2010. This is simple, but there's something heavenly about it. Simple's not always a bad thing - makes room for a bigger tiara, right? Upper Right: Monique Lhuillier. The folds of fabric on the skirt add some detail to an otherwise flat canvas. And this whole thing has a real Grace Kelly feel to it, which always gets you brownie points. Bottom Left: Monique Lhuillier, Spring 2010. This dress could make a body look insane. Well corseted at the top, deliciously full at the bottom. I'm envisioning it with the spaghetti straps widened into little cap sleeves in the same material for cathedral modesty. 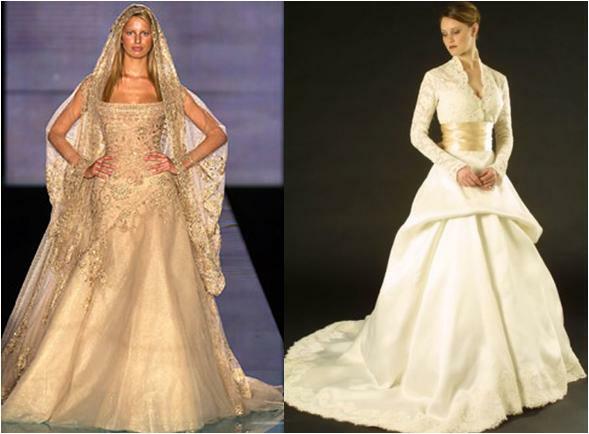 Bottom Right: Monique Lhuillier, Fall 2010. Another study in creating a teeny-tiny waist. What really draws me in here is that the skirt seems to have a nice flow to it, rather than the stiffness you typically get with a huge skirt. And how a dress moves is key to a successful royal wedding dress - after all, millions of people will be watching your every motion on television! Another thing you might as well go all out on if you're having a royal wedding is the intricate details. Chances are, you're getting married in one of your country's architectural wonders, and you might even be getting married among a sea of evening dresses and tiaras. It's your day, be the most bejewelled you can be. Upper Left: Elie Saab, Fall 2004 Couture. Same bodice-to-skirt flow fabulousness, but with more sparkle. Unless you're going for the Ice Princess look, lose the fur. Upper Right: Elie Saab, Spring 2007 Couture. When I first laid eyes on this baby, I gasped. Audibly. 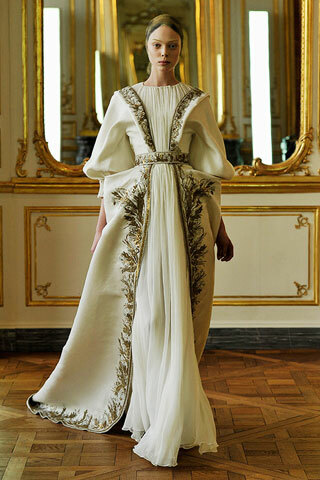 This is couture as couture should be - over the top, detailed to the nines, completely showstopping. A royal bride at an evening wedding wearing this would easily jump to the top of the list of most memorable royal wedding dresses . 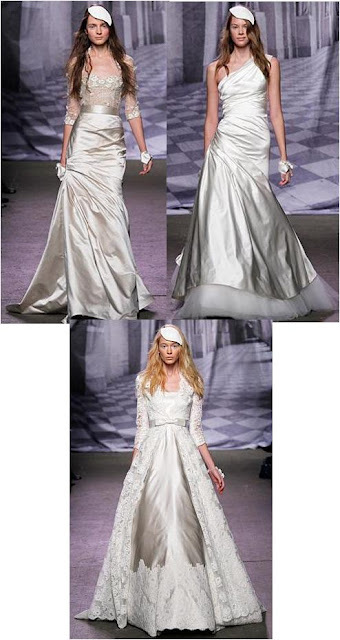 Middle Left: Monique Lhuillier, Spring 2010. Multiple kinds of detail going on here: the folds of the skirt, the ruching of the bodice, the beading/embroidery at the neckline. It all works together to bring your eye up to the bride's face. And how divine would it be to have the embroidery detailed to match the motifs in the bride's tiara? Middle Right: Oscar de la Renta, Spring 2010. A classic shape done in a most unconventional fabric. You may not like this at first, but look at it longer. It's kind of hypnotic. 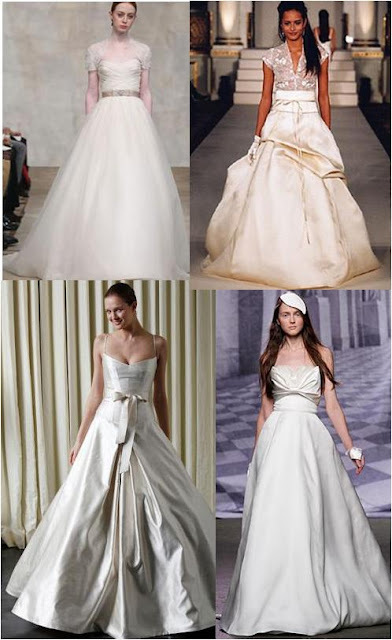 Bottom Left: Monique Lhuillier, Fall 2010. I love the idea of including the greatest amount of detail on the skirt. It can be overkill, but this wave-like application of fabric hits all the right notes. It's got to look amazing in motion, too. Bottom Right: Derek Lam, Fall 2010 Ready-to-Wear. Never underestimate the power of good draping. It can create a wonderfully detailed dress without any embellishment whatsoever - a great way to bring detail to a daytime wedding. Color! It's unexpected, and always memorable. If you think it's not bridal enough, do some searching through the wedding photos of some of Asia's royal brides. Why stick with just white? Left: Elie Saab, Spring 2003 Couture. An ivory or beige dress is a way to ease into color. If this isn't a dress fit for a royal, I don't know what is. Another, bolder way would be a delicate shade of pink - divine! Right: Monique Lhuillier. This Princess Grace-esque dress dips its toe into the world of bridal color with a beige sash. But think what other colors you could use....how about a national color, or the color of your royal house? I've read that Crown Princess Victoria will wear blue and yellow shoes on her wedding day to honor Sweden's colors, but what about adding some into the dress? She won't wear her sash for the Order of Seraphim, which is a pale blue, but she could incorporate it into the dress in other ways. Let's finish off this marathon post with something from WAY out in left field, shall we? So help me God, I like this. It's kind of reminiscent of a national costume, no? I said anything goes, didn't I? What's your vision for the perfect royal wedding dress? Serena Linley: Pretty in Pink? Princess Letizia in Color - Again! Letizia, Are You at the Right Event? Does the Pink Dress Look Familiar to You?